WOW Guests at Your Next Event with Our Tasty Party Favors! Leave a lasting impression on your guests with the tastiest party favors! Our French macarons have become a popular choice for weddings, showers, birthdays, & more! These delicate treats come in a variety of fun flavors. Macarons are as delightful to the eyes as they are to the taste buds, and they can even be custom colored and packaged to match your celebration’s theme! We also offer macaron gift boxes that make perfect bridal party gifts! *Parameters do apply. Custom colors and stickers come at an additional cost. 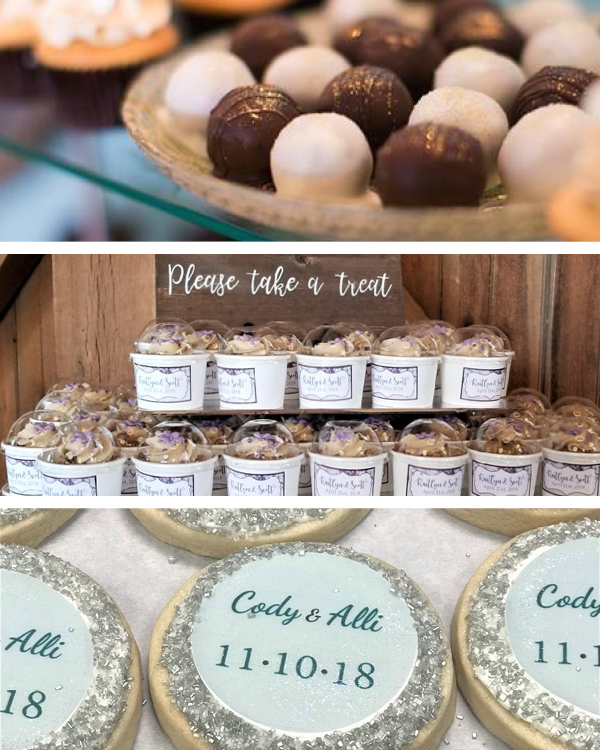 You can also order cake truffle, cookie dough, or custom cookie favors! These other tasty treats are just as sure to add a sweet touch to your celebration! Just as with our macaron favors, custom packaging/stickers are available to personalize your order. These alternative favors can be specially ordered and packaged per your specifications for as little as $4 each.